You’ve seen it parodied online and discussed in real life: People gathered together, their faces immersed in their individual mobile devices. And a new study from the Pew Research Center verifies what many of us are thinking and feeling about being “alone together,” as Sherry Turkle wrote in her 2012 book discussing how technology is influencing our understanding of intimacy. 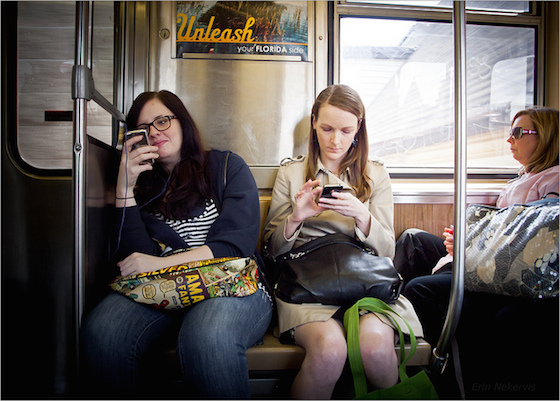 We are used to the near ubiquitous presence of cell phones, but what constitutes appropriate “mobile etiquette” is still not a universal idea. Photo by Flickr user TheeErin and reused here with Creative Commons license. Nearly all U.S. adults — 92 percent — own a cell phone, and about 76 percent report leaving their phones on at all times. While the majority of respondents said that this “always on” mentality has its negative effects, nearly nine out of ten people also reported using their phones during a recent social event. It might be easy to pass this off as a bit of hypocrisy at play. But it could also be that most people are struggling to figure out what’s socially acceptable in different circumstances, according to Lee Rainie, director of Internet, Science and Technology Research at the Pew Research Center. The study’s results do indicate a “surprising degree of consensus on certain cell phone do’s and don’ts” in different places, as Vicky Gan wrote in CityLab. 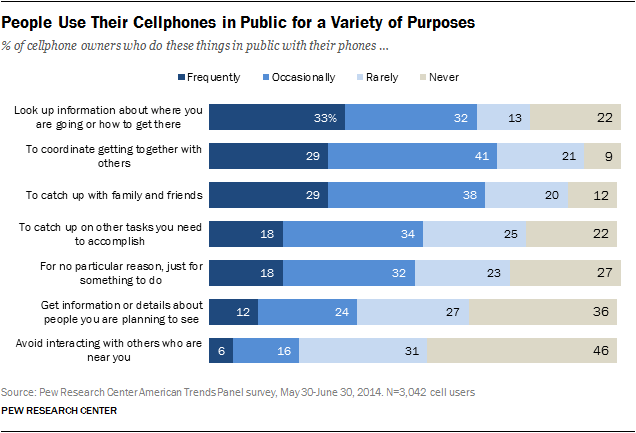 For example, three-quarters of respondents said using a cell phone on public transportation is OK. But different cell phone activities like taking a picture, placing a phone call or responding to a text message often have their own etiquettes attached to them. If the study had focused on how people interpret these individual activities instead of how they view cell phone etiquette broadly, it probably would have yielded more nuanced answers as to which activities are more or less polite than others, according to Rainie. That rings true to users like Victoria Swing Yambao too. “It just depends,” said Swing Yambao, a nurse based in the San Francisco Bay Area. She finds it annoying when people use their phones in front of others, but is OK with people responding to a message quickly. “I think it also depends on who you’re going out with, and how comfortable you are with that person to use a cell phone in front of him,” she said. Generally speaking, though, the results indicate many people are using their cell phones to actually engage with what’s happening at the moment, rather than to use at it as a way to remove themselves from a current circumstance. For example, 45 percent of respondents reported using a phone at a recent social event to post a picture or a video of the gathering. Gender, age…and a generational shift? When it comes to gender and age disparities in remarking on proper mobile etiquette, women are more likely than men (41 percent compared to 32 percent) to feel that cell phone use at a social gathering is disruptive. People over the age of 50 are also much more likely than their younger counterparts to say cell phone use in public hurts a group conversation. Since this is the first time Pew has ever conducted a survey of this nature, it’s hard to tell to what extent these results speak to a wider generational “shift” taking place in how people interact with their digital devices, Rainie said. Similarly, the results also don’t speak to the physical reality being “more” or “less” important than virtual interactions. What the research does suggest, though, is that a mobile device doesn’t always have a negative effect on managing your attention. It has to do with how people interpret the situation. The full Pew report is available online. Sonia Paul is a freelance journalist based in India, and is the editorial assistant at MediaShift. Her work has appeared in a broad range of media, including the Al Jazeera Media Network, Caravan, Foreign Policy, Guardian, Mashable, New York Times, PRI’s The World, Roads & Kingdoms and VICE News. She previously produced the grant-funded podcast series Shizuoka Speaks, based in Japan. She is on Twitter @sonipaul (and Instagram, too). This piece originally published on September 16, 2015, on MediaShift.